During a recent visit to northern NSW I stayed at Bonza Bamboo and had the opportunity to cut some bamboo, and the time to treat it. There was also the opportunity to call in to Byron Bamboo, in nearby Tyagarah. While Lance and Carolyn were away exhibiting at Strand Ephemera 2015, I was holding the fort at Bonza Bamboo and cutting and treating some of their bamboo to take away with me. Some poles were left standing with the solution inside for 3 weeks. 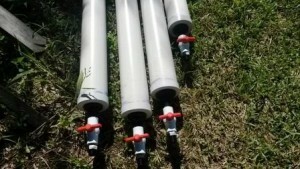 For others, I availed myself to Lance’s simple and efficient PVC storm water pipe method. This is ideally suited for bamboo splits and very small diameter poles. 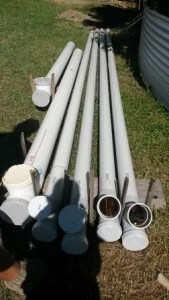 PVC storm water pipe of varying lengths, as seen in the photos, are fitted at one end with a 45 degree junction. Both ends are capped with a screw fitting. The lower part of the junction facilitates the loading of the bamboo. Once the bamboo is loaded the cap is screwed on. The upper facing part of the junction is where the preservation solution is poured in. The other end of the storm has an inline tap fitted into an end cap. In Lance’s system, this drains to a large drum that sits at a level below the PVC pipes to use gravity to empty the pipes after the treatment is complete. All the parts to make this treatment system are readily available at your local hardware or plumbing suppliers. I couldn’t locate any 90mm fittings on eBay , but there are some inline taps there. The cost: It is an expensive product and, once diluted for use, is only effective for a month. It’s very strong chilli content makes it dangerous to skin and eyes. It has a real burning effect, so from a WHS point of view here in oz it wouldn’t be deemed safe. Ultimately, she has returned to using soluble boron, Dissolvabor, like Lance. This entry was posted in All, Bamboo product reviews, Building and Home Renovation and tagged bamboo, bamboo preservation, harvesting bamboo on 15/09/2015 by Deb.